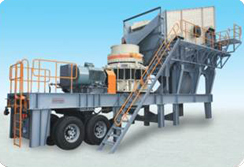 SAMYOUNG PLANT has two types of crushing plant, Stationary crushing plant and Mobile Crushing Plant namely portable crushing plant. 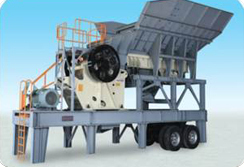 Portable Crushing Plant means it can move with wheels by trailer. 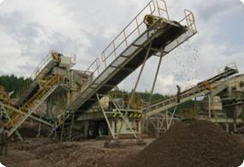 We called it ‘Semi-mobile crushing plant’ sometimes. Mobile crushing plant is good for using in Road construction jobsite or the place where resource (feeding material) is limited. 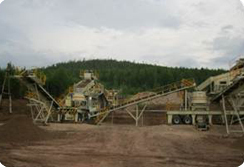 Usually Mobile crushing plant is available from 50ton/hr crushing plant to 200ton/hr crushing plant capacity, used to use in abroad market, Asia, Africa, Russia & CIS, Latin America..
1.This Mobile Crushing Plant unit is used as a primary crushing unit for working singly to provide“ all-in”material or the first stage of complete portable plant. 3. All equipments are mounted on single welded steel chassis as semi-trailer with twin pneumatic wheels. 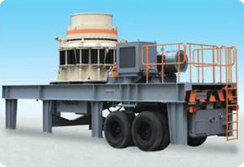 1.This Mobile Crushing Plants is suitable for screening and recrushing the crusher-run product from primary unit or used as a primary unit for working singly to screening and crushing the gravels. 2. All equipments are mounted on single welded steel chassis as semi-trailer with twin pneumatic wheels.